Peninsula College will induct four individuals, Mark Amaral, Curt Bagby, Kent Brauninger, and the late William Quenette, as well as the 1999-2000 men’s basketball team into its Pirate Athletics Hall of Fame at a ceremony scheduled for June 2. It will be Peninsula’s third induction event, this one set for 5 p.m., June 2, at the Cedars at Dungeness Golf Course banquet room. The event will begin with a social time at 5 p.m. with the program starting at 5:30 p.m. Light refreshments and hors devours will be served, along with a no-host bar. Inductees are asked to reserve space for themselves and their immediate family members by contacting Ross at rross@pencol.edu. Admission is free for inductees, families, friends and guests as space allows. Peninsula College is proud to have been on the front end of Coach Amaral’s outstanding career in college basketball. 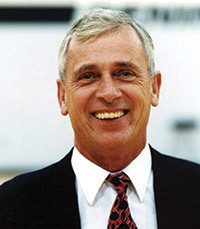 The College hired Amaral to re-launch men’s basketball in 1997 after the sport was dropped in 1981. He brought six years of assistant coaching experience to Peninsula from Carroll College, Lewis-Clark State and Montana Tech, but was quick to build an exciting and competitive Pirate men’s basketball program as its head coach. He put together a winning record in just his second season (19-9) and then went 28-6 in his third year to win North Region Coach of the Year - and the first league championship in the history of Peninsula College. In his three seasons at Peninsula, he went 58-31, and laid the groundwork for what has been a very successful modern history of Pirate men’s basketball. After three years at the Pirate helm, Coach Amaral went on to join the staff at UC Santa Barbara where he helped coach the Gauchos to two Big West championships and a trip to the NCAA Tournament in a seven-year stint. From there, he served two years at Colorado State, two years at Cal Poly, and then seven years as Associate Head Coach at Pepperdine, where he helped the Wave post its first winning season since 2005 in 2014-15, qualifying for the post season two straight years. Just this spring Coach Amaral accepted a position as Head Assistant Basketball Coach for the Xinjiang Flying Tigers of the CBA in China. 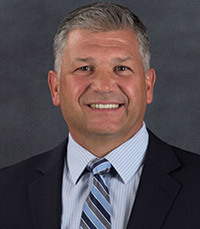 Peninsula College was fortunate to hire Curt Bagby as its first intercollegiate women’s basketball coach when the College relaunched basketball in 1997. Coach Bagby came to Peninsula following an outstanding high school career coaching girls’ basketball and football at Port Angeles High School. In his final nine years coaching the Roughrider basketball team, he won seven league championships and made five trips to the state playoffs, including a second-place finish, the best ever in PA girls’ basketball history. At Peninsula, he assembled the very first women’s intercollegiate basketball team from the ground up in 1997 and then went on to win 57 games in four years. Coach Bagby took the Pirates to their first two Northwest Athletic Conference Basketball Tournament appearances in school history and twice won North Region Coach of the Year honors. His overall body of work included 41 years as a highly respected and successful basketball and football coach. His historic and notable contribution to Peninsula College was as a women’s basketball “founding father” who not only achieved success himself, but also laid the ground work for the program’s success that followed. 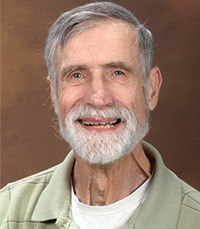 Kent Brauninger came to Peninsula College in 1968 to teach mathematics. He volunteered to help Athletic Director Art Feiro and the Pirate basketball program as a score clock operator. An outstanding math professor by day, he was at the scorer’s table at night, keeping the precise time and score for Pirate basketball games from 1968-1981 when the College dropped intercollegiate sports. He then returned to the score clock in 1997 when the College re-launched basketball - and he’s been at the table almost every home game since. Kent ran the score clock for more than 500 basketball games. He is also one of Peninsula’s major Pirate Boosters and one of the Colleges’ longest-running Pirate fans. He retired from Peninsula in 2000, but not only stayed on to teach math part time for a few years, but has also remained as a volunteer at the scorer’s table for 18 years…and counting. The late Coach Quenette was the first coach in Peninsula College sports history, hired to teach physical education and to form a “club” basketball team in 1962-63, one year after the College was founded. He then coached Peninsula’s first intercollegiate basketball team a year later in 1963-64 and went on to serve four years as the Pirate head coach. He also coached golf, baseball and track during that time, and helped design the current Pirate gym, which was built in 1966, the year he moved back to Moorhead, Minnesota, where he had started his coaching career at Concordia College in 1957. Coach Quenette would spend the remainder of his 47-year career teaching PE and coaching football, boys and girls basketball, baseball, and golf for Moorhead High School. He was also on the basketball staff at Concordia, and football staff at Fargo Shanley High School in North Dakota. 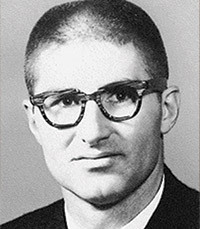 Coach Quenette, who passed away in 2013 following a rich life dedicated to his family, his church, his community, and thousands of student athletes, now resides in an astounding six halls of fame, including The Minnesota High School Basketball Coaches, Concordia College, Minnesota HS Coaches, Moorhead Hall of Honor, West Fargo High School, and now Peninsula College. 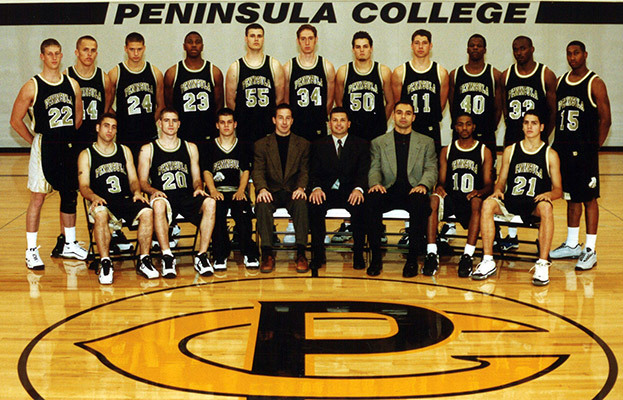 The 2000 Pirate men’s basketball team, under head coach Mark Amaral, was the first in Peninsula College history to win a league championship. They also became the first team in Pirate history to earn a No. 1 ranking in the NWAC Coaches’ poll following a nine-game winning streak that propelled them into first place in the North in early February of 2000. After falling to Olympic for one of only two league losses, the Pirates won their last four games to capture the North Region championship. They were among the favorites to win the NWAC Basketball Tournament that year, but an injury and a buzzer-beater contributed to a heart-breaking 71-70 loss to Southwestern Oregon in the opening round. The Pirates went on to place sixth. The PC men finished the season 28-6 overall, which still stands as the most wins in a season in Pirate men’s basketball history. In addition to Coach Amaral, the team’s coaches included Pat Foley, Brant Borghorst and manager Jason Robinson. Players included Olaf Arvidsson of Ostersund, Sweden; Brian Bell of Puyallup; Brent Bevers of Kissee Mills, Missouri; Mike Bowland of Colville; Leroy Johnson of Tacoma; Kenny Lutz of White Salmon; Ray Munyagi of Dar Es Salaam, Tanzania; Justin Murray of Tacoma; Masero Nyirabu of Dar Es Salaam, Tanzania; Eric Smilay of Port Angeles; Jeff Terrill of Vancouver; Steven Towne of Bothell; Aaron Vandenberg of Quilcene; and Barry Willis of Seattle. In 2016, the Peninsula College Athletics Hall of Fame inducted the NWAC champion 2010 men’s soccer team, the late Jim Lunt, Rose Gala Moorhead, Howard “Scooter” Chapman, and Jim Clem. In 2014, the year the Pirate HOF was founded, Peninsula inducted the WAC champion 1970 men’s basketball team, Jerry Allen, the late Art Feiro, Kathy Murphy-Carey, and the late Dr. Wally Sigmar.